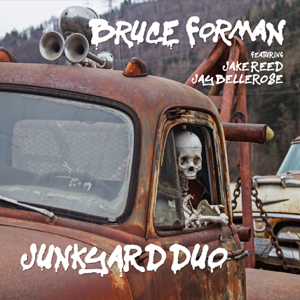 Clearly Bruce Forman went into the studio with the intention of keeping the tape rolling as he played his heart out for these twenty-nine tracks on Junkyard Duo. If that were the case then this is a remarkable recorded document because throughout there is no feeling – not even a fleeting one – that some parts of it sound like a rehearsal disc. The music comes in one viscerally exciting wave after another and in the rising and falling of each the power of the raging current remains. The sophistication of the harmonic language is another aspect of the music that is ear-catching. But it is the proportion of the two aspects that is striking for never once is the raw, bluesy nature of the music compromised or even watered-down to make room for a refined ersatz. Harmonic viscera emboldened by a sense of emotional prescience informs this music that seems to be invented on the fly by Mr. Forman together with his two drummers, Jake Reed and Jay Bellerose, both of whom bring their considerable firepower to the duets that they are involved in. 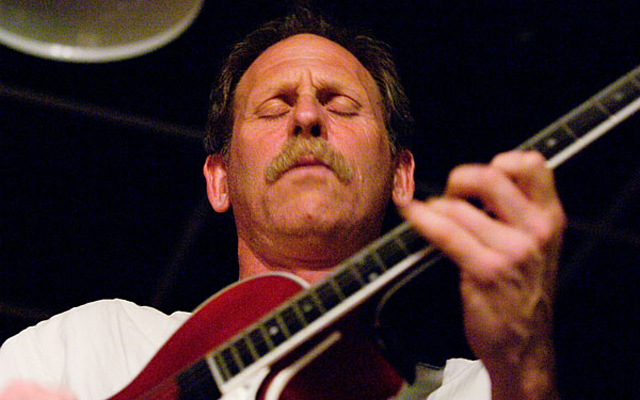 But Mr. Forman lays down the law, drawing from a plethora of styles – bluegrass, traditional country and the folk blues – all of which he is extraordinarily proficient in. Mr. Forman also has an enormous vocabulary of sounds and effects that could combine to make his playing – even if he were to play solo – sound as big as an ensemble. Here his duets do the trick, of course. And he is shrewd enough to deploy the entire range of guitar vocabulary with great distinction: harmonics, technique exotica such as “nut-side”, “nail-sizzle” or “bi-tone tapping” and several other effects generated by equipment both on the instrument and at his feet. As a result the music is lyrical and rambunctious, argumentative and reticent, joyous, bitter and sardonic. It all depends, of course, on what the intention of any given song really is and also when Mr. Forman intends for that particular song. He is also capable of composing complex tunes – that dig deep emotionally as well as show themselves to be on top of guitar chops, tone, colour and timbre and “Ray Brown’s Bass” is a classic example of this kind of craftsmanship. “Shenandoah” and “America the Beautiful” is truly special. Blending distortion with smooth, melodious playing Mr. Forman takes both to the absolute limit, going further than most guitarists and musicians; the way Jimi Hendrix did with “Star Spangled Banner” in Woodstock and with a gunshot of a last note in the former song. Whereas in the latter he also throws convention on its head and pursues the music as if he were conjuring a combination of Sonny Sharrock and the New York avant-garde musician Dom Minasi and the Brit, Fred Frith. Throughout his playing Mr. Forman gives notice that he is wielding his instrument like a small orchestra, making it truly polyphonic where, at times, every string is a different colour, a different voice.